Its crunch time for the fleet - will they make the Netherlands? Crews awoke to sunshine beating down on the boats. All was quiet in the marina again and the pontoons were damp from heavy rain overnight. It appeared that the stormy squalls had passed. It was crunch time for the fleet, would they make the Netherlands? Time Flies departed at 8am, Keith and Claire aboard had an hour and a half to reach Zeebrugge, the notorious bumpy spot and assess the conditions once more. The report was good and conditions were much improved over yesterday. Neale gave the fleet the go ahead and by 11am all boats were on their way up the coast towards Vlissingen. With time to kill Time Flies proceeded back along the coast into Blankenburg for some much needed fuel and then headed out to meet the fleet boats on track. 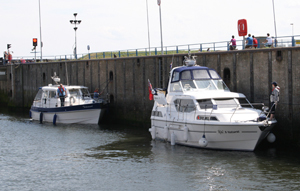 In the midday sunshine the first boats were entering the locks at Vlissingen . The canal on the other side gave a welcome change of pace and there was an air of excitement and anticipation among crews, they had finally reached the Netherlands. In the slowness of the canal kettles were boiled and lunch was served. There were a few delays in Middleburg waiting for bridges to open. By the lock at Veere support RIB Time Flies was accompanying a large convey of fleet boats. 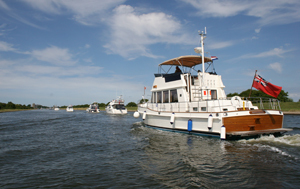 It has been decided that the fleet will make for Brouwershaven tomorrow where the fleet will spend two nights. Looking ahead, to get back on schedule the fleet will now unfortunately have to miss out a visit to Port Zeelande. After a briefing regarding tomorrows passage most crews gathered in Yacht Club and enjoyed a superb three course meal. Tomorrow the fleet will depart in three groups, the first departing at 11am, the second at 1130 and the third at 12.